Andrew Carey draws upon the latest thinking in the areas of innovation, creativity and inspiration, team dynamics and the psychology of motivation, including Peter Drucker's Innovation and Entrepreneurship, Teresa Amabile's Creativity Under the Gun, Clayton Christensen's The Innovator's Dilemma and Carol Dweck's Mindset. He interweaves these theories of innovation and behaviour with particular examples from the story of the Project Red Stripe team, creating a catalogue of experience that echoes the most common challenges faced during the initial stages of any innovation project or by any new team. 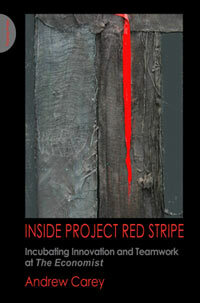 Inside Project Red Stripe suggests new ways of approaching thorny team and innovation problems and provides a wry insight into the workings of homo creativus. It also offers a fascinating look inside a small London office to show how six of The Economist's cleverest people worked at the 'bleeding edge' of technical and technological know-how but still didn't get their office door to stop slamming for the first five months.